Advertising thrives on acquisitions and new blood, so the state of agency mergers and acquisitions can reveal a lot about the wider industry. A new report by the investment banks JEGI and Clarity, which are based in New York and London, respectively, and have worked closely together on media deals for four years, looks at how things have been changing. The study identifies several trends. First, there is a growing range of buyers beyond the traditional "big six" advertising holding groups. Second, sellers are more varied as agencies are involved in a broader spread of marketing disciplines and the lines between those disciplines are blurring. 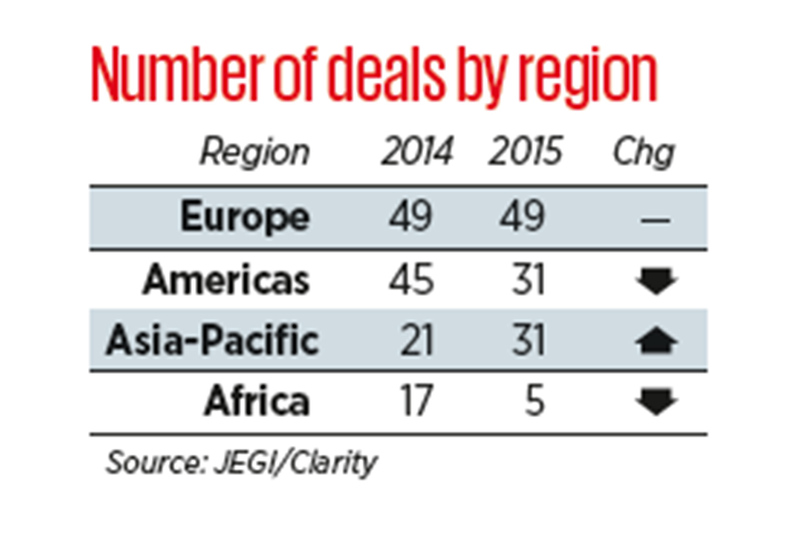 Third, the M&A market has become more international, fueled by technology and relatively buoyant economic conditions. Marcus Anselm, a partner at Clarity who worked on the sale of Walker Media (since renamed Blue 449) to Publicis Groupe and Adam & Eve to Omnicom, says: "If you were running a communications agency five years ago, the list of buyers would have been X number of names that most people would have heard of. "Wind forward to 2016, and the list of names is so much bigger now – the consulting firms, the accountancy giants, the software companies and so on. Many of them are global and in lots of different locations." This shift has been part of the rationale for JEGI and Clarity to announce a deeper partnership this week and a joint rebranding to reflect the fact that clients want "boots on the ground" in different continents to know they have the best deal. The "Big Six" ad holding groups are still driving takeover activity, buying 116 agencies between them last year, according to the report. Although the number of deals fell from 132 in 2014, it was on a par with the past five years, when there have been roughly 115 transactions annually. WPP, the biggest group in the Big Six, maintained its position as the top buyer. It acquired 44 agencies in 2015 — including the digital outfits Essence and the Exchange Lab — compared with 64 a year earlier. Dentsu overtook Publicis to become the second most-active player despite being only the world’s fifth-biggest ad group. Dentsu’s acquisition of 26 agencies, including the content publisher John Brown, was significantly up on its 16 purchases in 2014. In contrast, Publicis only made 22 deals last year — down from 27 in 2014, which included the $3.7 billion takeover of the digital consulting company Sapient. 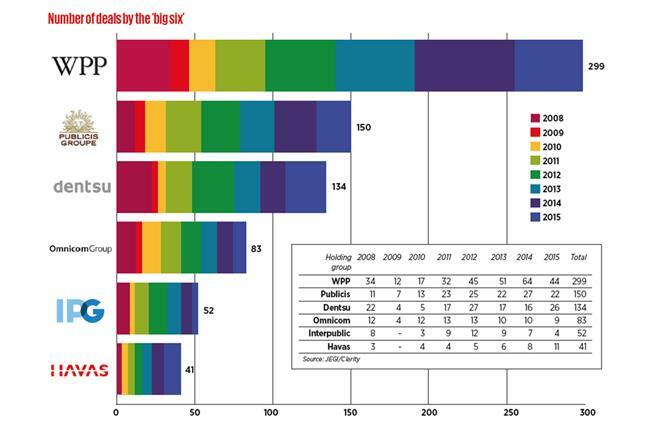 Over the past eight years, including the 2008-2009 downturn, WPP, Publicis and Dentsu stand out as the most acquisitive, ahead of Omnicom, Interpublic and Havas. The deals by the Big Six are only one measure of activity because of the influx of new entrants. Consulting and accountancy companies such as Deloitte and Accenture, media owners such as News Corp and Time Inc, and technology groups such as Salesforce have all been making acquisitions — particularly in new areas such as automation, content creation, digital transformation, e-commerce, mobile and social. "We continue to witness a wider scope of acquirers in the marketing arena," the report states, citing News Corp’s purchase of the social video company Unruly as an example. The Unruly deal points to another trend: the growth in content creation by brands and the digital distribution of that content through social and programmatic platforms. The study identifies three drivers for growth: the rise of content distribution platforms such as Percolate and NewsCred, the importance of data and analytics to target that distribution, and the threat of ad-blocking, which makes creating engaging content more important. The great M&A deal that didn’t happen was the Publicis/Omnicom tie-up, which collapsed in 2014. The report suggests that the smallest of the Big Six, Havas, which is controlled by Vincent Bolloré, is the one to watch, since he also chairs the media giant Vivendi, the owner of Canal+ and Universal Music Group. He is pushing for the content and advertising businesses to "collaborate" and "it is certainly a merger the market is looking out for." Leaving aside stock market jitters surrounding China, the study is bullish about the short-term outlook. Corporate balance sheets are mostly in good shape, private-equity companies such as Chime’s owner, Providence, are sitting on cash, new holding groups including Be Heard and The Stagwell Group have emerged, and there are the Olympics and the US presidential elections this year. "We do think momentum will continue in 2016. In independent agency sellers’ minds, it feels like a good window," Anselm says. "But, at the back end of 2016, the visibility is less clear. Some people who are thinking ‘Should I sell this year or next?’ may say: ‘We’ll get a better valuation this year off a slightly smaller profit than waiting until 2017.’ "